…Testing also showed that the scope of the performance gains correlated with the type of replication and the type of data. Push subscription replication of character data with SQL Server 2008 running on Windows Server 2008 yielded a 104 percent increase over SQL Server 2005 running on Windows Server 2003, and pull subscription replication of the same data yielded a 1,298 percent gain. Both lab and real-life testing by the MSCOM Ops team indicate that highly trafficked Web sites can gain the benefits of geo-replication most effectively when the site is built on SQL Server 2008 running on Windows Server 2008. 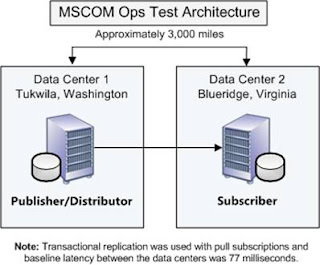 Based on solid evidence of the feasibility of WAN–based geo-replication, MSCOM Ops plans to expand its implementation of this solution. Windows Server 2008 and SQL Server 2008 with the TCP/IP stack improvements and partnering with application development teams can bolster global user experiences, produce higher availability, higher scalability, and better resiliency for sites, services, and applications through WAN-based geo-replication. Replication performance is significantly better for pull subscription scenarios than push subscriptions. The solution identified in this paper will not work for all applications, particularly applications that cannot handle the inherit latency involved with replicating data between geographically dispersed data centers." To sum up, there are significant gains in terms of performance, scalability and disaster recovery implemented in SQL Server 2008 on Windows Server 2008. Not only will it be much faster than SQL Server 2005 on Windows Server 2003, but also much secure and cheaper. Therefore, SQL Server Replication technology will be considered a stronger solution inclusive for high availability purposes. I hope you enjoy reading both document as they are a good read. That is all for now, let me know any remark you may have. Thanks for reading.